The immediate question, no doubt, is what differentiates ‘blush’ pink from powder pink? Naturally, it’s a nuance, a whisper between shades, however essentially blush pink is simply more pink! 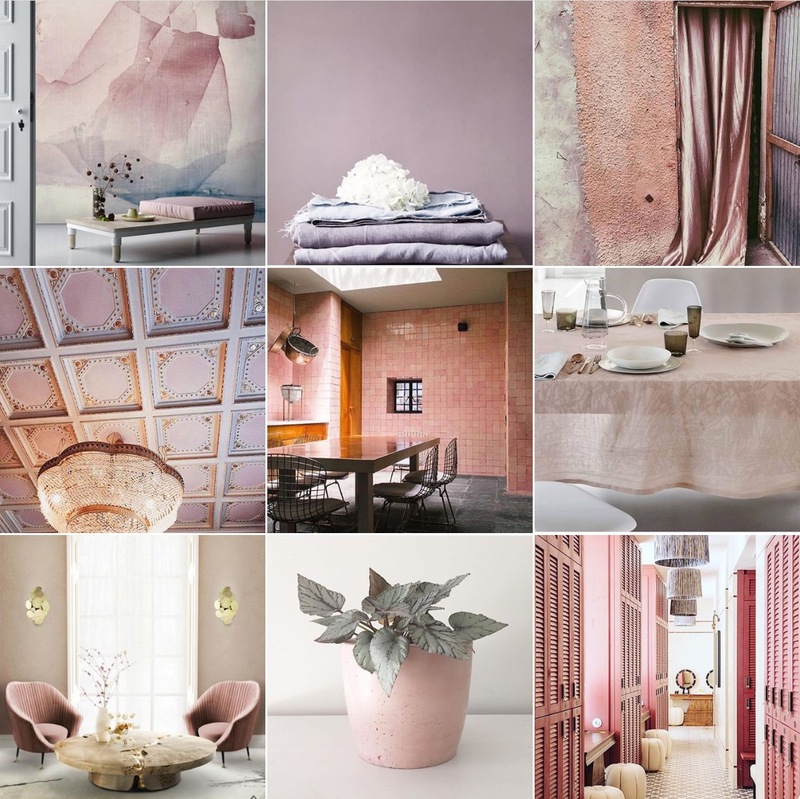 Where powder pink is washed down with grey thus taking a slightly more masculine stance, blush pink is more flushed with femininity but without descending into Barbie doll territory. It’s also allowed more scope, as in more range to be so very pink. In other words, blush pink covers a palette of acceptable pinks from those with a dose of orange in them, to those with almost a smudge of blue. And yes, for the pedants reading this, the image at three o’clock on the moodboard below is arguably more powder, if not plaster pink… I humbly proffer it’s there deliberately to demonstrate the contrast. The image at seven o’clock also rather wonderfully demonstrates, powder pink on the walls, with what I’d describe as blush pink upholstered lounge chairs. I’d use this pink in much the same way as any other, ie with fullsome abandon. a little or a lot, it’s sure to have an impact, but I actually prefer a lot. I ache to re-upholster my sofa in a pale pink velvet simply because it’d be so deliciously unexpected, and yet so perfectly synonymous with leisurely lounging. Silken drapes that rustle in the breeze would be inherently decadently romantic. And layered bedsheets and eiderdowns always work well, most especially because pink is said to induce happiness, calm and joy. Harder surfaces take well to this hue too, whether accessories or wall coverings. Again, my main tip is only to use it plentifully. Not one plant pot, several. Not one painted wall, two. Not a single chair, a pair. Somehow, this shade lends itself to more really being more. Tis the colour of youth and lightheartedness, enjoy!